Renault Sport Formula One Team drivers Kevin Magnussen and Jolyon Palmer experienced a mixed-weather start to the Austrian Grand Prix with a dry morning and dry-wet-dry afternoon in the Styrian mountains. Kevin ended the day faster of the two with a 1min 09.525secs as his best lap. We achieved a good lap tally in the morning, but the downpour early in the second session disrupted today's programme for both cars. Both drivers enjoyed a trouble-free day's running. Pirelli's ultrasoft (purple) compound tyres were used in the first session, the soft (yellow), supersoft (red), intermediate (green) and ultrasoft tyres were used in FP2. 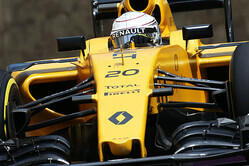 Kevin Magnussen: "A pretty good day. We made some positive improvement with the car and now have better traction, better braking and more grip. It feels a lot more stable in the high speed corners so that's good too. We've still got some work to do but I feel much happier with the car than I have recently." Jolyon Palmer: "It got a bit fruity out there with the downpour even if there was a surprising amount of grip in the wet right up until the point the car spun! The car actually seems pretty good here and it was a solid day for us. It feels like we're making some good steps forward." Alan Permane, Trackside Operations Director: "Despite being interrupted by some pretty heavy showers in the afternoon, it was a reasonably productive two sessions for us. The new track surface is impressively smooth, free of bumps and gives good grip. Both drivers were happy with their cars today. The rain interruption does mean we are short of long-run data which is something we hope to rectify tomorrow."